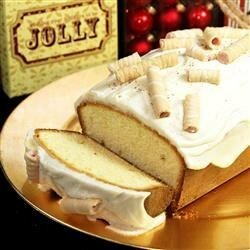 "An eggnog flavored pound cake, wonderful for holiday gatherings." Preheat oven to 350 degrees F (175 degrees C). Grease and flour an 8x4 inch loaf pan. Sift together the flour, baking powder, salt, nutmeg, and ginger; set aside. In a large bowl, cream together sugar, butter, and shortening until light and fluffy. Blend in the eggs one at a time, then stir in the rum extract. Beat in the flour mixture alternately with the milk, mixing just until incorporated. Pour batter into prepared pan. Bake in the preheated oven for 65 to 70 minutes, or until a toothpick inserted into the center of the cake comes out clean. People that don't like eggnog love this cake. I took it to a cookout last night and it disappeared in minutes!!! Just tried this recipe for Thanksgiving and it is super. I made it in mini-loaf pans and baked for 40 minutes to give to neighbors. Fantastic butter-rum flavor. Good cake to go with tea. A new holiday tradition for me! Yummy! Good flavor, but not a true pound cake texture. My family thought it was to dry.